What would you do if you won the Lottery? Have students share, then inform them that they have already by being born into Western Society. This geography unit will show them the truth of that fact every day. branch of geography that focuses on the study of patterns and processes that shape human interaction with the environment, with particular reference to the causes and consequences of the spatial distribution of human activity on the Earth's surface. 3. We will watch the video clip "7 Billion" which reveals what the Chapter is really about. We will then discuss what students found interesting in the clip. 4. We will then watch a video clip called "7 Billion: Are you Typical?" This will show us what the most typical person looks like. 4. As a class, we will read over unit outline to discuss what the unit will consist of. See file below. 4. Scavenger Hunt for Population Notes. Mr. Fitton has created a Scavenger Hunt to help the class learn about all of the information that is crucial to understanding the unit. Students will get into groups of 4 and will be given a fill in the blank chart for notes. They will start in the classroom and have to copy down the unit notes on Population. Once they have copied down the section in class, they are to use their smartphones to Scan a QR code which will lead them to a location where they will discover "Policeman Perry" with the next set of notes. 5. Discuss notes. As a class, we will look at what each one of the notes means. Students can elect to hear Mr. Fitton discuss the answers in lecture format, or in groups they can get together and they have to teach the class what a section of the notes means. -Discuss how students have won the lottery already being born into north America. -We are some of the richest citizens on earth. -Mr. Fitton urge students to travel –this will give them an education in life. It will show them how many others live. -Discuss who has traveled and seen the items listed in the clip? 2. Population Density Powerpoint. We will view the Population Density powerpoint below. 3. 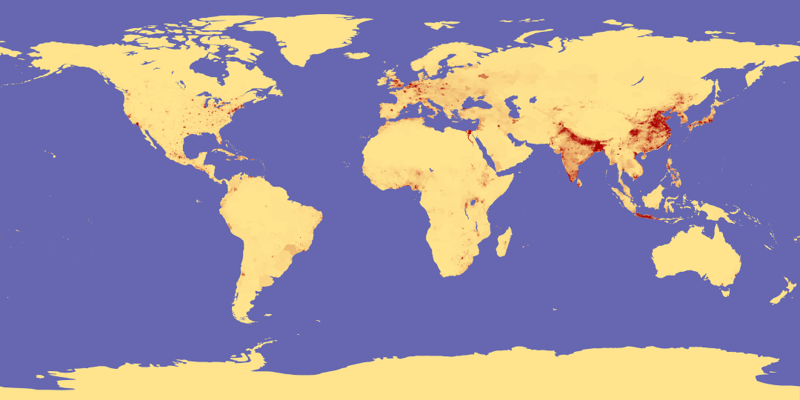 Discuss Population Density – where do most people live? (Near equator, why?-warm). Where do most Canadians live? Look at picture on pg. 358. 4. Go over Population density chart. Pg. 382. ACTIVITY 1: Mr. Fitton will draw a box on the floor using chalk. Students are to try to fit as many as possible in the box. This will demonstrate density. ACTIVITY 2: We did a small activity as a class to show the concept of "Personal Space." As a result of our low population density, we have a a distinct and large sense of personal space. This is not the case in crowded areas. Students who felt comfortable, were asked to stand as close to another student as they could without feeling uncomfortable. Some students could stand closer, others had a larger personal bubble. Mr. Fitton then showed a powerpoint that explains how population grows in a similar fashion. We will review population growth, which is exponential, with the powerpoint below. 7. As a class, we will read P. 373-74, and discuss the Good/Bad aspects of an aging population. 8. Students will receive "The demographer" assignment. Students are no longer mere students in Socials 11, the are to become professional demographers. This assignment will help to apply knowledge learned in class today. 7. Homework: Students Must Complete "China's One Child Policy" and "Malthus" assignment for Homework. Will discuss in class next day. B. https://youtu.be/VcSX4ytEfcEb Quick video on how we grew so quickly. We will start the day by looking at: http://www.worldometers.info It is a website with a lot of real-time stats and facts. 1. Review Malthus and One Child Policy - was for homework. As a class, we will "circle up" and discuss answers to Matlhus worksheet, then Discuss India and China and their solutions to population issues. 2. We will watch a powerpoint of "Population Cartoons." This will help to review the issue of an expanding population. Tie in with Malthusians and the term “Carrying Capacity.” Also, Mr. Fitton will explain “Nutritional Density” – How much nutrition in calories can be produced from the land. (More in china, as some rice can grow three crops per year, whereas only one/two crops in lower mainland of BC). 3. Read Page: 380 – define "Ecumene." Explain how our readings relate to the video we are about to watch, which talks about four countries facing issues relating to population. 4. Video from Library: NOVA “World in the Balance: Population Paradox.” DVD in library. However, also available at the youtube location below. C. USA - Pollution/Population: 34:30-51:00. 7. Students will be able to work on unit vocab if done early. 3. Get into groups of 4, Each group will come and choose a population pyramid for a developing nation and a developed nation and answer the questions about population pyramids. They will glue or tape the population pyramid to chart paper and write the questions below it. 1. Look at each graph and compare them to the Demographic Transition Model. Identify the stage that you think each of your graphs fits into (page 366 of Counterpoints) Remember the DTM is different than population pyramids. 2. Describe the shape of each graph in relation to your notes: Is it an early expanding, expanding, stable or contracting pyramid? How do you know? 3. What age groups (cohorts) hold the largest percentage of the population for each graph? Give possible reasons for the differences between your two countries. What problems result from a country with a large dependency ratio? What issues comes from a population with a large number of adults 16-64 and a low number of young children? 5. Write down as many reasons as you can think of to explain the differences in the graphs for the different countries. Be as specific as possible in trying to link the reason with how it affects the graph. 8. Review Activity: View these odd pyramids and discuss (China - one child policy look at cohorts of 5-14 year olds).- Bahrain why would there be so many more men in this middle eastern country?" Class has to hypothesize. 2. Show them the Website: http://globalrichlist.com/ If you even make minimum wage in Canada you are considered rich in the world. 5. Read over Unit Overview. 6. Major Determinants of Health assignment. Have students take handout on “Major determinants of Health” and get them to find the answers. On rear of the sheet is Unit Vocabulary. For homework. 7. http://www.youtube.com/watch?v=_V-2NKUlzns Play from 0-5:31 “Coney Island Hotdog Eating Contest” to show the disparity between rich nations and poor nations. Lesson 6: The Plight of Women! 1. Review key points of slideshow, review the HDI and emphasize why it is hard to get out of debt. ; Review "Major Determinants of Health" sheet that was for homework. a. What is the difference between a want and a need? b. What is the poverty line in Canada? Worldwide? c. What are the three ways the UN determines a country's rank on the HDI? 2. Activity: Foreign debt Pennies -Provide students with their country sheets and ask Questions posed by the assignment. (See activity from Engaging Students Through Global Issues – Activity Based Lessons and Action Projects – “What’s Debt Got to Do with It?) In this activity, students become a country in a group of 4. They receive money every year (in the form of a penny, which represents a million dollars) to spend on Health, Education or Infrastructure. They are mean to empathize with what it would be like to be a HIPC (highly impoverished poor country). 1. What happened in year 3 and 4 when you had allocated most of your money to debt? How did it affect other areas of development? How would investment in Health, education and infrastructure contribute to a poor countries’ development? 2. When you didn’t have to put money on debt, where did you put it and why? 3. Do you think it is fair that countries ask you to pay back loans and interest, even if there is no money for medicine and schools? Would it be fair if loaning countries never got their money back? 4. Who bears the responsibility for the debt cycle? The IMF and World Bank who lend the money, or the countries who borrow it? 5. How might cycles of debt actually benefit a rich country? 6. Should aid be tied to human rights? 3. In democratic countries (like ours), the government has enshrined equality rights for women and laws have been passed to protect children and severely punish those who abuse them. What about the rest of the world? Notes on Status of Women in the world – students are to copy off the board. + Show women in Nigeria chart. 5. Ask students to make a list of what they do in a typical day. Then ask them to turn to page 402 of textbooks and compare to Amina’s (of Zambia) day. When discussing this, have 10 volunteers go outside and carry a book on their head, must make it to the other end of the grass without dropping or will have to turn back and start again. This is frustrating for three minutes, imagine how frustrating it would be if you had to do it to get water for three hours every day. Can alternatively do this back and forth across the front of the classroom. 7. Using the section on “Women in Niger”, have students web the living conditions of a woman in this poor country. Should look like the web on the rear of the lesson page: Or just show them the web. 8. Watch the clips below on the "Girl Effect." These videos showcase the importance of helping women in order for a country to rise through the ranks of the HDI. 1. Read pages 404- 408 and make Cornell Notes on the section on Children in Crisis. Only should have 3-4 points per section at most. 2. Review the names of agencies concerned with children and what they are most concerned with. Discuss the major point of children in crisis in the textbook. When discussing Children in war, talk about Child soldiers. 3. Show video clips: Blood Diamond 2:45-6:00 abducting children to become soldiers. 4. Invisible Children Clips. Invisible Children is an excellent documentary that details the difficulties faced by Children Worldwide as they are recruited to become child soldiers. As a class, we will watch certain parts. Part 6: (4:00-end) Section details how we cannot forget them and their plight. 5. Here are some additional videos on Child Labour. 6. Go over Unit Overview and Key Vocab for the Chapter. 7. During this unit, we may also watch "Living on a Dollar a Day" which is a documentary about Living Standards and Poverty. While doing so, we will fill out a sheet to help us prepare for an essay on Geography. 1. REVIEW: pandemics, health crisis and other issues. -Go over Unit Outline for unit just completed -Have students read out loud different paragraphs. 3. Sustainability notes: Begin notes on sustainability. -Class will do notes on Biosphere and sustainability. At this point intercut notes with “Sharing The Cake” Activity from “Engaging students through global issues” textbook. -Show students a pie chart that represents the world population in a pie chart. (get students into groups where they get to represent a portion of the globe. ) Students will enter and draw a card out of the hat. On the card will list the continent they get to be part of. This is meant to simulate how when you are born you are basically in a lottery of life - and you may be born in North America, but could just as easily have been born in Africa. Mr. Fitton will create continents out of the desks. Asian continent will be spaced close together. North Americans will have space - this harkens back to our earlier discussion of Population Density. -Have 20 cookies (which represent the world food supply) In groups they get cookies. Can allow immigration if they want. (Should make signs for their countries) – review immigration/emigration. *Show “Aquifer” picture to help explain what an Aquifer is. C. Ecological Footprint Notes --- take notes, then stop and do the following website activity. From DVD – Inconvenient Truth. TOTAL LENGTH: Approx 30 mins of viewing. National Geographic. Play “Human Presence --- Diapers and Milk” 00:47-11:40 – Cellphone is 1:21:30 Discusses our ecological footprint. E. Agriculture and Soil Notes. -Explain how agriculture is the number one user of water. A. Given that there is a fixed amount of fresh water on the planet, what do you think will happen to the distribution of the water resources as the global population grows? B. What happens when people do not have enough water to meet their basic needs? C. What happens when a fresh water resource is polluted? D. How does the greater use of water resources in developed countries affect the availability of water resources in water-scare countries? 6. Distribute “Environmental Concerns” handout. Students must complete it. -Put students into groups and provide with large paper. They have to come up with a thesis and then a point form list of ways that they could answer the question. 1. Describe realistic strategies that Canadians could use to reduce their negative impact on land, water and the atmosphere. 3. Provide reasons why developed nations are at the top of the United Nations Human Development Index (HDI) and why developing nations are at the bottom. 5. What indicators help determine quality of life, and how are Canadians helping aid developing countries. 6. Describe how sustainable development can protect and preserve the planet. 7. Describe the Social/Economic/Political challenges Canadians face as they attempt to reduce the impacts of Global Warming. 8. Global Warming is the most important environmental issue facing the world today. Evaluate this statement and describe Canada’s response to this issue. 9. Describe Canada’s and Canadians’ role in attempting to solve poverty problems in developing nations. 10. Explain the difficulties that developing nations face as they try to break the poverty cycle. -Each student writes the title at the top of the page. 11. Play “Canadians for Global Warming” to start the days before projects….